An IDF drone that was circling in the skies over Hevron fell and crashed on a private rooftop in the City of Patriarchs Sunday. Local residents handed it over to the Palestinian Authority's security forces, which gave it to the IDF. The drone was damaged in the crash. The 12-lb. 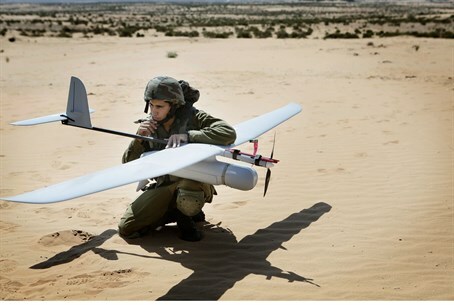 Skylark unmanned aerial vehicle (UAV) has been keeping an eye on IDF soldiers as they search painstakingly for the teens abducted 10 days ago, and dismantle Hamas' infrastructure in Judea and Samaria. Video footage released by the IDF shows the UAV's bird's-eye view of ground operations being carried out by large scale IDF forces in Judea and Samaria. The UAV helps commanders verify that their raids on targets are proceeding smoothly and detect ambushes, reinforcements or getaway vehicles in time.